Is taking control of your own health, as well as your family’s health important to you? Learning all about natural remedies using herbs and essential oils, is how you begin to do that. I know it all sounds overwhelming. And I know it can be confusing with all the different information or opinions out there. Don’t let it frustrate you. I want to save you money on your goal of natural health. As well as save you time and frustration. Because I know it can be time-consuming and hard work. And I want to make the journey into a natural health lifestyle easier for you. What if I told you someone has put together a complete package to get up to speed on using herbs and essential oils? And help you dig deeper into the research and learn more advanced techniques, once you’ve got the basics down. What if I told you this package was already vetted for you? Saving you time! What if I told you it was at a price that’s way too low to miss? Saving you money! For the next two days, everything you need (and then some) is in one fabulous package! And at the most affordable price ever. This is a spectacular deal, but wait until I tell you the price! 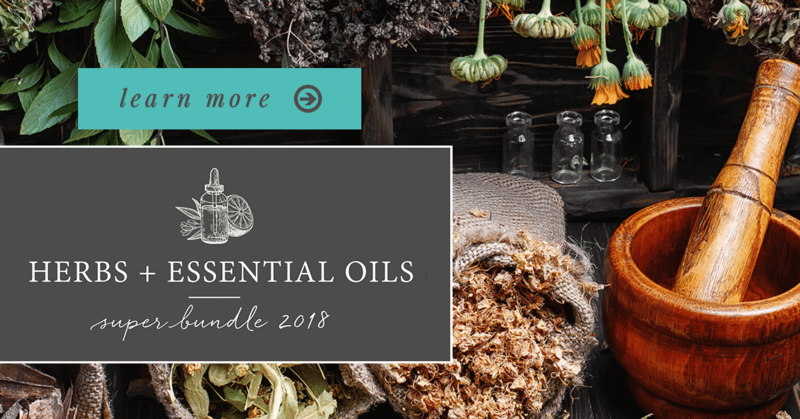 This year’s edition of the Herbs & Essential Oils Super Bundle includes 28 ebooks. As well as printables, 4 full eCourses, and 2 membership sites! These resources will give you all the skills you need to use natural remedies with confidence. Rebuild your medicine cabinet with natural remedies. Create beauty and skincare products without harmful ingredients. Treat your digestive complaints, pain, colds, and the flu with natural remedies. Know which herbs are safe for pregnancy, babies, and children. Discover which natural substances combat multi-drug resistance, infections, and even cancer. Prepare herbal extracts, salves, and balms with confidence. Liven up your meals and get major health benefits by using the right herbs. You need to see it to believe it! This package includes 34 digital products and it’s worth over $560 (but you’ll get it for 95% off)! Besides being an incredible help, one of the things I like best about the bundle is the price. By offering it for a short time only, the team at Ultimate Bundles is able to give you access to ALL this… for ONLY $29.97. You’ll receive an email with a login to the online access portal. There you will begin downloading your eBooks. Sign up for your eCourses and redeeming your free bonus offers. Use the Getting Started Guide to pick the topic you want to tackle first. That’s it, you’re ready to start using natural remedies! The most important detail, though, is that this bundle is available at this price for ONLY 2 more days! After Monday night, June 4th, the price goes up. It’s even backed by a 100% happiness guarantee so you can make sure it’s right for you. You want to protect your health. So you shouldn’t have to feel overwhelmed because it costs too much. Or because it’s too hard to find trustworthy resources that make using natural remedies easy.